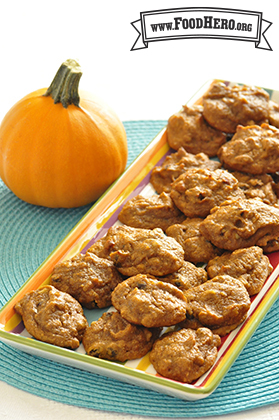 5 Comments for "Breakfast Pumpkin Cookies"
I have made this cookie for public events and at home and they are always well received. I do replace the raisins with dried cranberries and use all whole wheat pastry flour. Using whole wheat pastry flour is a great tip! Really interesting recipe! Next time I will for sure try it with oats to replace some flour like the user Gooseberry suggested. As is my daughter loved these cookies and they taste even better the next day! They do have a bit of that chewy texture a low-fat cookie usually gets but they are still super yummy and i am sure the oat sub will help with that. I use this recipe monthly. I add Whole oats (1 Cup) with decreasing 1/2 cup white flour and 1/2 cup wheat flour. It helps to make the cookies and/or muffins lighter and not as heavy if you where to leave out the whole oats. Makes great Muffins! These make the morning go a little easier! I bake them the night before for a quick, portable breakfast!